To make things super simple I offer just the one package that provides coverage for all of the main events on your big day. Starting with getting ready shots in the morning, I’ll be there for the entire day to capture fun, candid photos you, your guests and the events that unfold, culminating with the first dance in the evening (though truth be told, I almost always stay for some of the party afterwards, too!). Up to 10 hours of coverage, from bridal prep until the first dance. Travel and accommodation included within England - reasonable travel fees will be added for destination weddings. At least 400 high-res images, professionally edited in the timeless style you see here on my website. Private online gallery to view, download and share your images, as well as order any prints you may want. Full print licence, allowing you to create your own personal prints. All of your final images presented on a USB stick within a beautiful presentation box set. 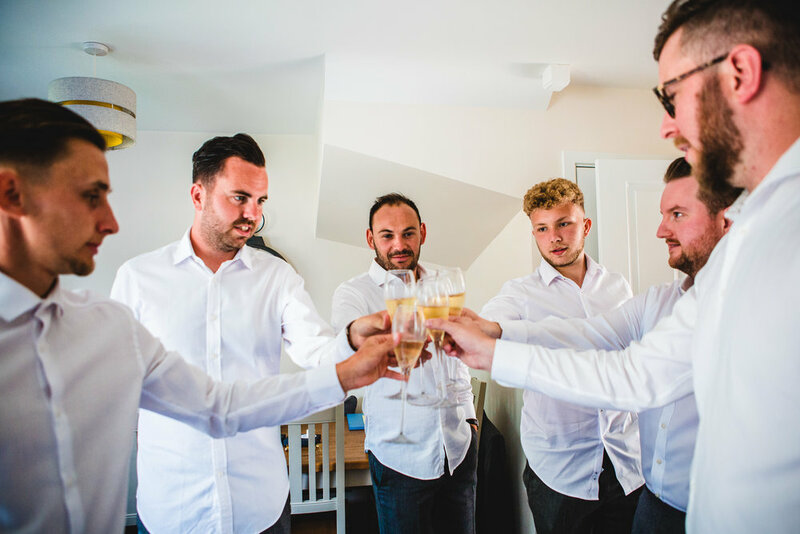 Whether you would like guaranteed coverage of the groom preparation before the ceremony, or you're simply hosting a large wedding with 100+ guests and require a greater degree of coverage, then I highly recommend opting for my Second Photographer add-on. When selecting this option I will be joined by a second professional wedding photographer who will provide additional photo coverage for the entirety of your wedding day (up to 10 hours). This price includes travel and accommodation for weddings taking place within England. A reasonable travel fee will be added for destination weddings. Let's face it, getting your photo taken is a bit of a weird experience. 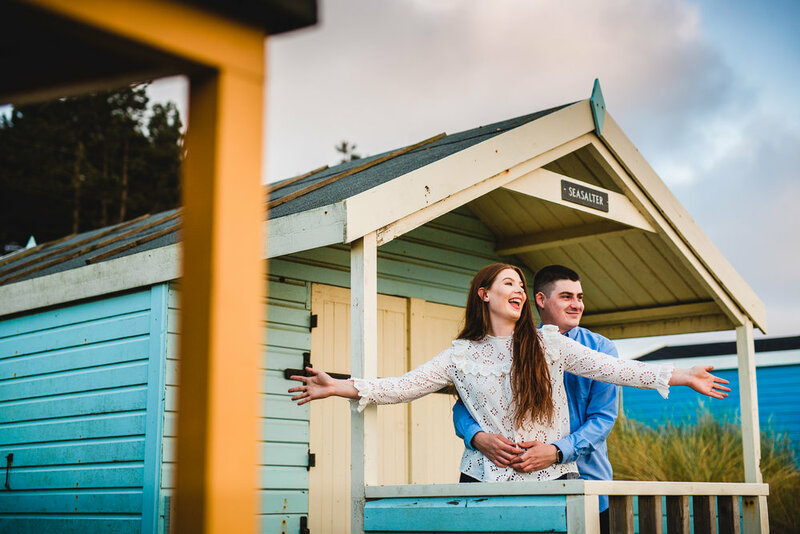 If the idea of being in front of the camera fills you with dread then what better way to shake off any post-wedding anxiety than by heading out on a practise run? Join me for a relaxed 1-2 hour shoot at a location of your choice (travel included within 50 miles of Peterborough) - we'll have a walk, a talk and we'll take a few photos. Not only will it give us a chance to get to know either other better, but you'll also get used to being in front of the camera. You can even use the resulting images for your Save The Date cards, or just to show everyone how gosh darn good looking you are! 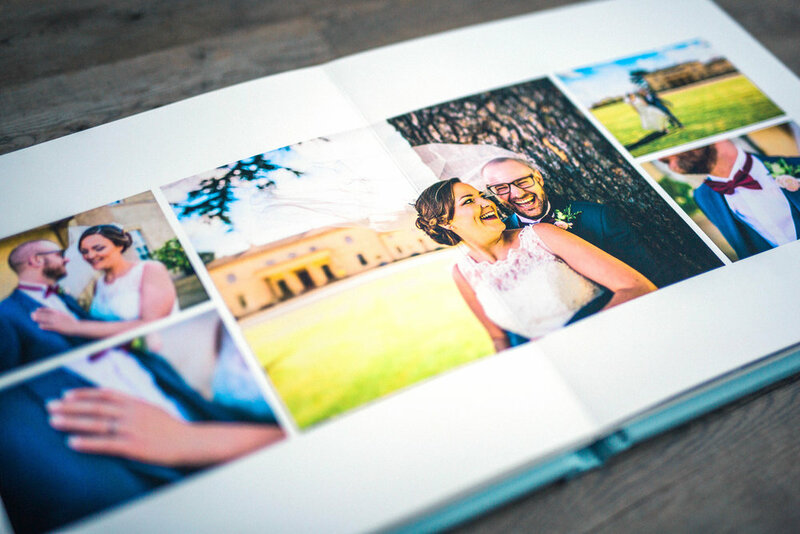 The best way to bring your photos to life is by displaying them as part of a stunning wedding album. My photo albums are all hand-made in the UK and are constructed from the highest-quality sustainable materials, with a wide selection of leather, cotton and silk covers to choose from. When opened they lay completely flat and have an almost invisible seam to ensure your photos are beautifully displayed and remain uninterrupted by ugly centre folds. The photos are printed directly on to beautiful matte finish paper for an uber-modern finish that's designed to keep your photos looking crisp and vibrant for a lifetime (when correctly stored). Click HERE for more info! Our Highlights Reel films capture your entire wedding day in a modern, easy-to-watch format that’s perfect for sharing online with your friends and family via social media . Unlike the more traditional style of wedding video that can be 1-2 hours in length, ours are designed to be watched over and over again, allowing you to re-live the happiest day of your lives in under 10 minutes. Up to 10 hours of coverage. 6-8 minute 1080p HD video set to songs of your choosing (like above). Private online hosting for easy sharing with family & friends. Final video presented on a USB stick within a beautiful presentation box set. Your wedding vows will be recorded in full, edited in to a separate video and included on your final USB stick. Your first dance will be recorded in full, edited in to a separate video and included on your final USB stick. If you would like guaranteed coverage of the groom preparation before the ceremony, or you're simply hosting a large wedding with 100+ guests and require a greater degree of cover, then I highly recommend opting for my Second Videographer add-on. When selecting this option I will be joined by a second professional wedding videographer who will provide additional video coverage for the entirety of your wedding day (up to 10 hours). This price includes travel and accommodation for weddings taking place within England. A reasonable travel fee will be added for destination weddings. Your speeches will be recorded in full, edited in to a separate video and included on your final USB stick. Purchase all of the raw, unedited footage taken straight from the camera, which will then be added to your final USB stick. Make the most of your venue's stunning exterior and scenic views by adding drone footage to your video. When selecting this option I will be joined by one of our CAA approved and fully insured drone pilots who will capture cinematic fly-bys of your venue and the surrounding views. PLEASE NOTE: Aerial videography is always subject to weather/wind conditions and the relevant safety inspections. The Cinematic package has been tailored specifically for couples who desire every moment of their wedding day to be captured in a Hollywood style. With this option you’ll receive two final videos; the first is a teaser trailer that’s perfect for sharing online, whilst the second video transforms your wedding day in to a feature-length film, including the full wedding ceremony, the speeches, and culminating with your first dance. 2-3 minute 1080p HD teaser trailer (like above). 60-90 minute 1080p HD feature film, including the wedding vows, speeches and first dance recorded in full. Why not make life simple and book us to cover both your wedding photography and videography? I'll even apply a £200 discount to your total as my way of saying thank you! I can offer a £200 discount to any of my packages for weddings that fall on a Monday, Tuesday, Wednesday or Thursday (this offer does not apply to Bank Holidays).